Associate Dianne Henke is a beekeeper. She admires the bees for their ability to work together to create a harmonious community. 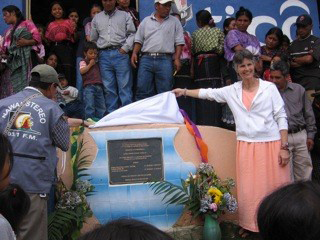 Creating this sense of community is what drew her to begin Global Partners: Running Waters, Inc., (GPRW) a nonprofit organization that gives villages in Latin America access to potable water. For the past 15 years, she has worked with this nonprofit organization that she co-founded with School Sister of Notre Dame Jan Gregorcich. The organization builds relationships through collaboration on water, food, health and education projects in Latin America, focusing on Guatemala. Dianne and Sister Jan met and began GPRW when they were both looking to start a new ministry. They traveled to Guatemala together, and upon realizing the scarcity of clean drinking water, realized they found their new mission. In 2003, GPRW was born. GPRW is successful because of the program’s structure. The entire village must be in agreement to receive assistance, build access to the water and maintain it. GPRW supplies the funding, guidance and training, but the village must do the work. GPRW believes that forming strong relationships with the people they assist in Latin America has four main benefits: sharing cultural and spiritual resources, improving health and living conditions, enhancing international dialogue and experiencing the best of humanity. To date, GPRW has completed 60 water projects benefiting 41,000 people. Women and children no longer walk for miles to a polluted river to get drinking water, wash their clothes and bathe. They have clean water outside their homes. The children experience fewer water-borne diseases and attend school more regularly; the extra time made available to women allows them to find ways to increase the family income. Learn more about GPRW and its impact. SSNDs call for immigration reform The Supreme Court’s recent ruling to block the Deferred Action for Parents of Americans and Deferred Action for Childhood Arrivals reinforces the need for Congress to enact comprehensive immigration reform. Our mission as School Sisters of Notre Dame Central Pacific Province supports and calls us to accept and serve all in need. St. Louis sisters, associates Adopt-a-Highway Sisters and associates in St. Louis took to heart Pope Francis’ call in his second encyclical, Laudato Si’, for people to take swift actions to improve the world’s environment. The section of I-255 at Telegraph Road they were assigned as part of the Adopt-A-Highway program got its first cleaning in August, with a second planned this month.